Doc explains the plan to Marty while Marty’s trying to get a peek of 2015 in the distance. Doc pulls out a USA Today newspaper and holds it up. “Youth Jailed” is the headline. The subheading reads “Martin McFly Junior Arrested for Theft”. USA Today was founded in 1982 where it first launched in the Baltimore/Washington, D.C. area. By the end of 1985, it was the second largest newspaper in the United States with a daily circulation of 1.4 million readers. Although newspapers are on the decline in 2015 and have some have closed or merged as a result of an increased reliance on the Internet, USA Today is still around. In March 2013, their circulation was reported to be 1,674,306. USA Today used the same logo from 1982 until 2012. In 2012, they replaced the logo with a new version. The new version features a large blue circle and a similar font. 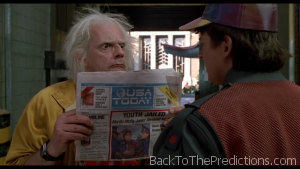 The USA Today logo seen in Back to the Future Part II more closely resembled the old logo with a “futuristic” font and a globe with fewer stripes. 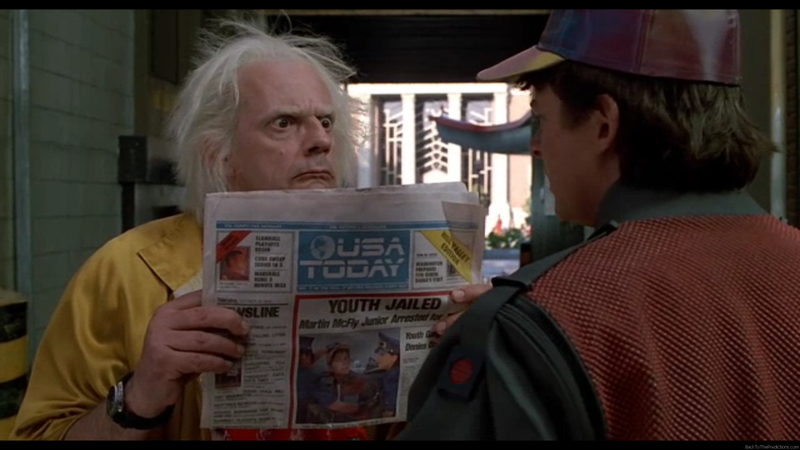 On the prediction that USA Today would still be in print and would still be called “USA Today”, the movie got it right. It also successfully predicted that they would change their logo even if the logo wasn’t quite as radical as what they now use. Note: There are a lot of predictions made in the newspaper itself…some successful and some not. We will be addressing each of those individually on this site from time to time. These posts will always be tagged with “USA Today” to help you find them.